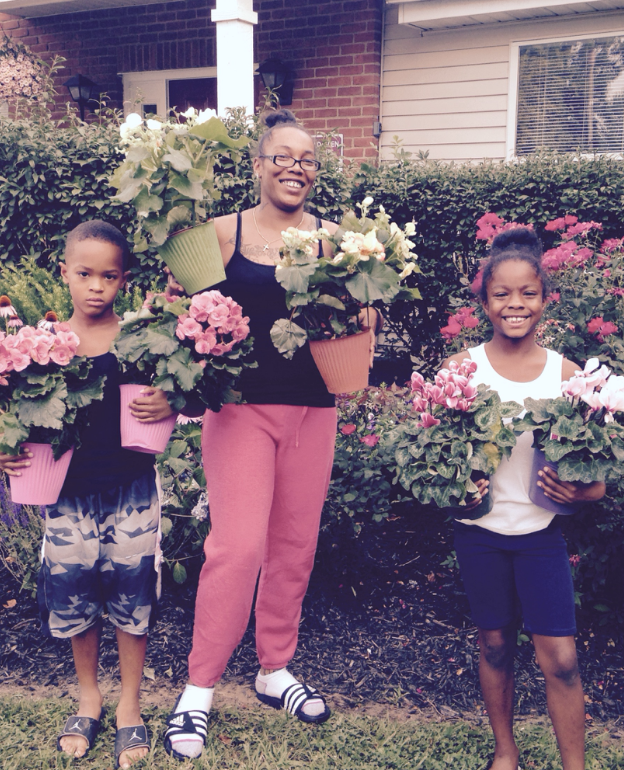 Emerald Glen resident Shelia Cunningham, and children Shamar Jenkins and Vermari Davis, participated in the flower give-away for the first time. For the 11th year in a row residents of Homeport communities have benefitted from flowers and plants donated from the national horticulture trade show held in Downtown Columbus. Attendees and exhibitors from AmericanHort’s Cultivate’17 returned to all 50 states by July 19, and on July 20 residents of Emerald Glen, Marsh Run, Georges Creek, Pheasant Run, Kimberly Meadows, Raspberry Glen, Elim Manor, Eastway and Fieldstone possessed colorful leftovers. “It is always exciting. You get to look over and choose what you want. I was the first one up there this morning,” said Emerald Glen resident Mary Stevens about the plant delivery coordinated to her community by property management company Community Properties of Ohio (CPO). “They are colorful,” said Stevens, who snagged Morning Glories for a hanging basket in front of her home. Emerald Glen resident Mary Stevens picked up flower for the 11th year. Homeport’s property managers CPO and Wallick Communities picked up the flowers and plants at the Greater Columbus Convention Center, delivering them in 5 U-Haul trucks, two pickup trucks and two cars. Homeport apartment rental communities have traditionally benefitted from the flower donation program but this year homeowners of communities American Addition and Milo-Grogan also participated. “The flower drop went so well in the homeowner communities that we expect to deliver to North of Broad next year,” Moncrief said.